Difference between revisions of "Ohio"
Ohio is the seventeenth state within the United States of America. On February 19, 1803, Congress passed an act stating that the citizens of Ohio had adopted a constitution in accordance with the 1802 enabling act and the state had become one of the United States of America. The Ohio General Assembly met for the first time in Chillicothe on March 1, 1803, the date Ohioans now celebrate as Statehood Day. Ohio is located in the Midwest and was the first state created out of the Northwest Territory, which originally included all of modern-day Ohio, Indiana, Illinois, and parts of Michigan, Wisconsin and Minnesota. The word "Ohio" comes from the Iroquois term "O-Y-O," which means "the great river." Chillicothe was Ohio's original capital, but in 1812, the General Assembly selected the city of Columbus to be the seat of government. The north bank of the Ohio River defines Ohio's southern border. To the north, Ohio is bordered by the state of Michigan and an international boundary with Canada that passes through Lake Erie. On the east, Pennsylvania and West Virginia neighbor the state and Indiana forms Ohio's western border. Ohio is approximately 355 kilometers across at its widest point. It is exactly the same distance from its most southerly to its most northerly point. The state encompasses 116,096 square kilometers of area. Land mass comprises 106,054 square kilometers and water makes up an additional 10,042 square kilometers. The state is shaped somewhat like a heart. As a result, Ohio leaders often use the phrase "The Heart of It All" to promote its business, educational, and recreational opportunities. The highest point in the state is Campbell Hill near Bellefontaine. It rises 1,549 feet above sea level. The lowest point in the state is at the Ohio River near Cincinnati, 455 feet above sea level. Within its boundaries, Ohio enjoys some of the most fertile soil in the United States. A series of glaciers that moved into the area thousands of years ago deposited much of that soil. The most recent of these left the region about thirteen thousand years ago. The glaciers also had a major impact on the topography of Ohio. The central and western areas of the state were smoothed and flattened. Eastern Ohio, which was untouched by the glaciers, features more rugged terrain marking the foothills of the Appalachian Mountains. Another important geographical feature in early Ohio was the Black Swamp located in the northwestern part of the state. It originally consisted of dense forests, and for much of the year, the land was flooded. During the mid-nineteenth century, Ohioans drained the swamp. This area now consists of some of the most fertile agricultural land in the United States. Before contact with European settlers, American Indian peoples from several major traditions occupied the area. The so-called "Paleoindian people" (an archaeological, not a emic, categorization) were hunters and gatherers who entered the region about 13,000 B.C. People of the so-called "Archaic tradition" were also hunters and gatherers who lived in the region from about 8000 B.C. until 500 B.C. The so-called "Woodland tradition," which lasted from about 800 B.C. to A.D. 1200 introduced pottery, cultivated plants, settled village life, and mound building to the region. Many of the mounds and earthworks created by various cultures of the Woodland tradition are now preserved as prehistoric monuments within the state. Perhaps the most famous of these is Serpent Mound in Adams County and the Newark Earthworks in Licking County. The last prehistoric people to occupy the region were members of the Late Prehistoric tradition. These people, who lived in large villages surrounded by farms, lived in the area from about A.D. 1000 to 1650. French explorers in search of furs first came to the area now known as Ohio in the 1660s. They found a richly forested area with abundant water, animal and mineral resources and a generally pleasant climate. Those same features later attracted English settlers from the colonies on the Atlantic seaboard who were more interested in farming and settling than fur trading. At the same time that the region was attracting the interest of Europeans, it was in the process of being re-settled by American Indian peoples including the Objiwe (Chippewa), Lenape (Delaware), Eel River, Iroquois, Kaskaskia, Miami, Seneca-Cayuga, Munsee, Ottawa, Piankashaw, Potawatomi, Sak (Sauk), Seneca, Shawnee, Wea, and Wyandot (Huron). British colonists claimed the area following victory in the French and Indian War. There followed several decades of on and off warfare between American Indian Ohioans and invading Anglo-American settlers for control of the land. The Ohio Indian Wars largely ended in 1813 at the Battle of the Thames, an important land battle in the War of 1812, when General William Henry Harrison defeated Tecumseh's Confederacy. 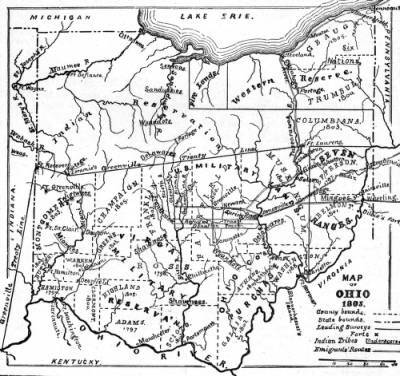 Throughout the 19th and 20th centuries, Ohioans reshaped the state's landscape with networks of canals, railroads, and highways. During the same period, Ohio's population swelled, and the state developed into a place with national economic and political influence. Although Ohio's population rank has declined recently, it is still the seventh most populous state, with 11,353,140 residents at the beginning of the 21st century. In 2000, approximately eighty-five percent of the state's population was white, 1.9 percent Hispanic or Latino, 11.5 percent African-American, .02 percent Hawaiian or Pacific Islander, 1.2 percent Asian, .2 percent Native American, and 2.2 percent of some other ethnicity. Columbus is Ohio's largest city, followed by Cleveland, Cincinnati, Toledo, Akron, and Dayton.